Raised bar - Suitable for tall people. Designed for wide doorframes with a maximum width of 36.22” (92 cm) and depth of 8.27” (21 cm) - Made for wider doorframes: fits a door width of 27.56” - 36.22” (70 - 92 cm). Comfortable - no more blisters on your hands! Soft foam grip - durable and nonslip. Extra thick rod ensures firm grip. 100% satisfaction guarantee! 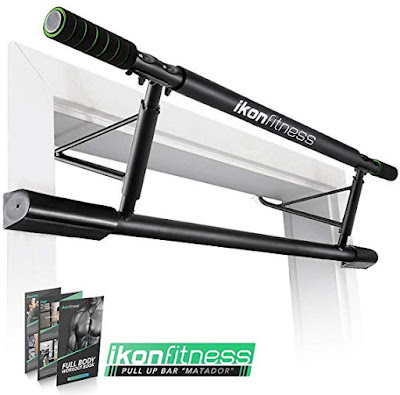 If you do not like the Ikonfitness pull up bar for any reason, just send it back within 60 days. Our friendly customer service members will refund you for the full amount! The bar itself was shipped in a very thin box which is due to its genius design. It has these two hooks that fold in and out and are spring supported. The metal itself feels like quality and I doubt it will bend (if it does I will update this). The bar looks very simple and pleasing to the eye. It stays put even when you are not hanging from it. Finally the most important thing, it was designed by someone who had a good grasp of basic physics and considered torque and application of force. The angles are just right, as I said it stays put without any force applied to it, but once you hang from it and there is a downward force, the bar will feel like it is part of the wall itself, you will feel very sturdy. It also requires ZERO assembly, its not that the last bar was hard to put together, no they usually take only a few minutes, but if you are buying one of these it's probably because you are renting and so are likely to move, taking the bar apart and putting it together is a pain and losing screws and parts is a real problem. This thing just comes down and folds away so moving it or storing it when it's not up is real easy. What is smart hook technology and how does this bar compare to other pull up bars? Smart hook is an unique design to solve the problem of traditional pull up bar easily falling down and causing damage to door frame. During the usage, the hook extends over the door to the back door frame, so the downward force when you grab on to the top bar doing pull ups is decomposed into the horizontal forces on the cap ends of the lower bar towards the vertical strip of the door frame and the downward vertical forces between the teeth of the tool and the top strip of the door frame. In such a way, your force is balanced by 6 smaller forces, each is much smaller, and saves the surface of your door, as well as making it safer. One "bad" thing I haven't seen mentioned in other reviews yet is the bar diameter is much bigger than every other pull up bar I've ever seen. This is "bad" in the sense that it requires a much, MUCH stronger grip, even with the padding it has, to do proper pull ups. A thicker bar translates to a far more difficult workout. So, for a beginner that struggles to do even a single pull up, this bar is going to make that struggle even worse. The upside is that if you stick with it, you'll be far stronger than you would have on a smaller bar. Similarly, if you're someone that's already really good at pull ups, this might be your answer to increasing the difficulty of your pull ups without having to risk injury or damage with belts, chains, and extra weight.